The feature game in the NBA Friday night more than lived up to its billing. The rejuvenated Dallas Mavericks went into Atlanta and stole an overtime 111-103 victory from the hometown Hawks in a game played at playoff-like intensity. As expected, All-Star starters Dirk Nowitzki and Joe Johnson led their teams in scoring – but this game belonged to Jason Kidd. The future Hall-of-Famer filled up the stat sheet with 19 points, 16 rebounds and 17 assists. For the man who, along with Magic Johnson and Oscar Robertson, is synonymous with the triple-double, last night’s performance was vintage. In fact, it was the first 15-15-15+ game in the NBA since Jason Kidd did it 14 years ago. 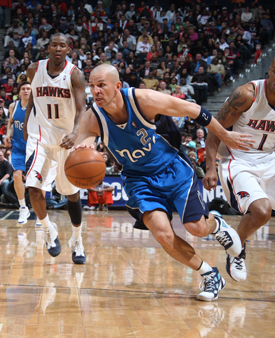 Kidd’s night was the latest in a Renaissance season for the soon-to-be 37-year-old point guard. After leading the New Jersey Nets to multiple NBA Finals appearances, Kidd was traded in 2008 to the Mavericks in a move that sent the much younger Devin Harris to the Nets. Kidd struggled to fit into the Mavericks’ half-court, slow-tempo offense which did not allow him to exploit his tremendous open court skills. He also had difficulty defending the young, super-quick point guards in the Western Conference such as Tony Parker and Chris Paul. The emergence of Devin Harris as a potential star with the Nets coupled with Kidd’s struggles led many to question the wisdom of the trade, particularly for a team that was a regular contender in the West. The Mavericks first round playoff exit that year at the hands of the New Orleans Hornets followed by another sub-par year in 2008-09 gave more fodder to Kidd’s critics. The Mavericks, however, kept their faith in Kidd and rewarded him with a new three-year contract prior to this season – a move that is now paying dividends. He has successfully adjusted his previously flamboyant game to fit with the Mavericks’ style. Although he does not regularly put up the same numbers he logged in the past, Kidd, for the first time in his latest tenure with the Mavs, looks like the confident leader he had been for his entire career. Last night Kidd played with an emotion and energy that seemed to have disappeared from his game the last couple of years. Fighting to the finish, Kidd nailed three consecutive 3-pointers in the final minutes of the fourth. And by creating contact with Hawks coach Mike Woodson, who had crept onto the court in open play shouting instructions to his players, the wily veteran even managed to draw a critical technical foul on Woodson and pick up a decisive point for his team. It is this poise under pressure that we have come to expect from Kidd over the years and that may help the Mavericks make a deeper playoff push this year. Mike Fratello breaks down Kobe Bryant’s game winning 3-pointer against the Grizzlies. The Celtics know if they want to get back to the NBA Finals they are eventually going to have to get through LeBron and the Cavs. Tonight they will have a chance to prove that they are still contenders. Boston will face the top team in the league for the second time this season in front of a sellout crowd at the Garden. Hardy Celtics fans are likely as eager to watch the LeBron and Shaq show as they are to watch their team get a much needed win and prove they’ve still got what it takes to contend for a title. Third in the East, Boston has lost recent games against some of the better teams in the league including Denver, Orlando and Atlanta. They beat the Lakers, but without Kobe. They need a win against a marquee team. A victory over the Cavs would be huge and their recent track record bodes well for their chances tonight. The Celtics have prevailed in five straight regular season games against Cleveland – including an impressive, opening night road-win at the intimidating Q. However the Celtics have also struggled at home recently, particularly in the second half of games. And they will be shorthanded – Paul Pierce is sidelined with a thumb injury and Marquis Daniels is questionable with the flu. 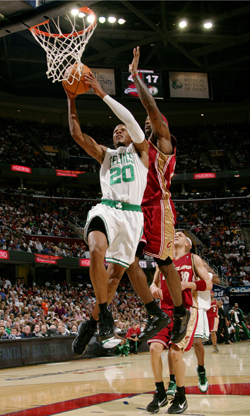 Ray Allen will need to be in good form – which will be an important factor for the Celtics in the playoffs as well. The Cavs look to even the season series and get the green monkey off their back, having lost nine straight visits to the Garden. More importantly they need to regain form prior to their Jamison acquisition and figure out how best to integrate him into their rotation. The Cavaliers are also competing with the Lakers for the overall best record and home court advantage in the playoffs. NBA on TNT presents national coverage of the Cleveland Cavaliers @ Boston Celtics at 8 p.m. ET. If there was any question as to whether the balance of power in the NBA has shifted from last year, the Lakers have done their best in the month of February to put that to rest. With their leading scorer and playmaker Kobe out for 18 days with injury, the Lakers simply went 4-1, including a road win against the streaking Jazz. Only a narrow one-point loss to the Celtics rose against their record. The icing on the cake came last night with the return of Kobe Bryant to the lineup. On the road against a Grizzlies team that has played the Lakers tough in recent games, Kobe scored the Lakers’ last nine points in an efficient 32-point outing highlighted by yet another game winning jump shot in the closing seconds. The implications of the Lakers’ recent streak are more significant than the impact on their overall record. With Kobe sidelined, the Lakers’ other marquee players demonstrated a confidence and swagger that is sometimes missing. The bench also performed to a higher level than it has during any stretch of play this year, perhaps sensing the urgency that Kobe wasn’t around to close games out. Add to this the best fourth quarter performer in the game (who is now rested and healthier than at any point this season) and one can understand why the rest of the league may be taking notice. While it is often the case that a team rallies in the short-term when a star player goes down, there seems to be something more far-reaching about LA’s latest streak. However, there remains a lot of basketball to be played, and the Lakers still need to put everything together into a cohesive, consistent package. If they manage to do so, we may well be looking at a repeat NBA champion. Lakers will meet the new and improved Mavericks tonight at 9 PM ET. Just another night in the broadcast booth with Marv. 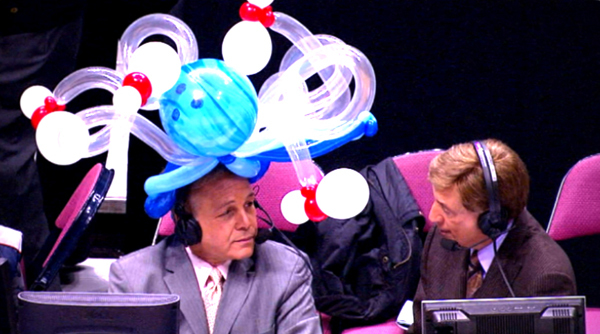 Mike's headdress upstages his tie during a Nets broadcast with Marv Albert earlier this season on YES.